Home » Behavior » Running out of answers? How about congestion pricing? Running out of answers? How about congestion pricing? A lot of people ask me about solutions to transport and traffic problems. Some are very general like the question “How do we solve traffic congestion in Metro Manila?” and others are more specific like “How do we solve congestion along EDSA?” These questions are becoming quite tricky because, for one, we are running out of answers of the ‘short term’ kind. All these ‘stop-gap’ or ‘band aid’ measures will only provide short-term relief and we have used many of them already including vehicle restraint measures we are very familiar with like the number coding and truck ban schemes currently implemented in the metropolis. The general answer and likely an inconvenient truth is that we can’t solve congestion. It is here to stay and is a given considering the continued growth experienced throughout the country. Accepting this phenomenon of congestion, we can proceed towards managing it and work towards alleviating it. Denying that there is a problem or dismissing such as an issue requiring urgent action sets a dangerous course towards unsuitable responses or worse, inaction on the part of the government. Like cholesterol, there is good congestion and bad congestion. Good traffic congestion is when it is predictable in occurrence and period. For example, the morning rush hour is termed so because it used to last only about an hour or so. Congestion occurring between 7:30 – 8:30 AM is okay but between 6:30 – 11:30 AM is undesirable. The cases between those two vary in acceptability based on the tolerance levels of commuters. In Metro Manila, for example, many people probably have been conditioned to think that 2-hour congestion is okay but more than that is severe. This is actually related to travel times or the time it takes to travel between, say, one’s home and workplace. And so, are there better options other than a return to the “Odd-Even” scheme? There are actually many other options but they are more complicated to the point that many are unpalatable to people who are in a hurry to get a solution our traffic mess. Note that this is to get out of a hole that’s deep enough already but they still managed to dig deeper the last 5 years. Among these solutions would be congestion pricing. Singapore offers a successful model for this where tolls vary according to the levels of congestion for these roads. There is a base rate for peak periods when congestion is most likely or expected. The government determines the desirable speed ranges along roads as a basis for congestion charges. Along urban streets, that range may be between 20 – 30 km/h. If speeds reduce to below 20 km/h (i.e., congested) then charges or tolls increase. If speeds increased to above 30 km/h, the rates decrease. 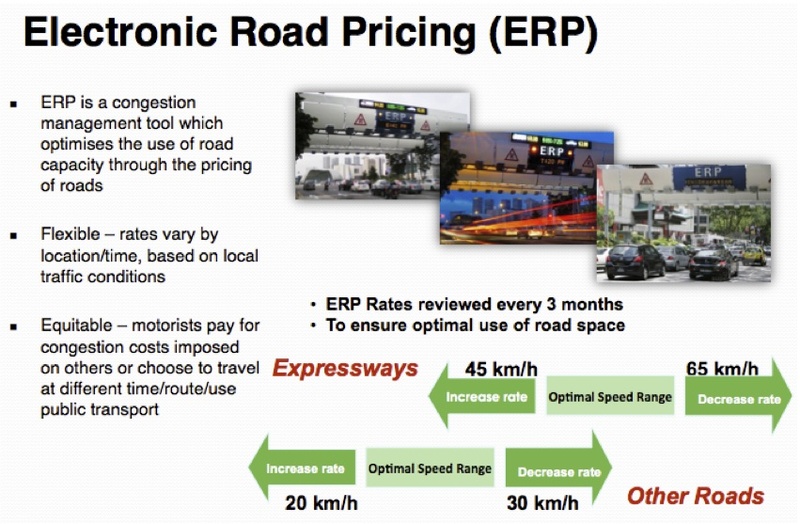 The image below is screen capture from a presentation made by an official of Singapore’s Land Transportation Authority (LTA). Note the item on the scheme being ‘equitable’ that is very essential in understanding how road space must be shared among users and that there is an option to use public transport instead. This scheme, of course, will require a lot of consultations but the technical part should not be worrisome given the wealth of talent at universities, private sector and government agencies who can be involved in the analysis and simulations. Important here also is to determine or institute where the money collected from congestion pricing will go. Logic tells us that this should go to public transportation infrastructure and services. In Singapore, a big part of the funds collected from ERP goes to mass transit including their SMRT trains and buses. Funds help build, operate and maintain their trains and buses. The city-state already has a good public transport system that is subsidized by congestion charges and this system is able to attract people from using their cars especially during the weekdays when transport is used for work and school trips. That way, people who don’t really need to own and use their cars are discouraged from doing so (Note: This works together with Singapore’s restrictive car ownership policies.). Would it be possible to have congestion pricing for Metro Manila or other cities in the Philippines? Yes, it is and but entails a lot of serious effort for it to work the right way. We can probably start by identifying major roads whose volumes we want regulated, installing sensors for monitoring traffic conditions and tagging vehicles and requiring most if not all vehicles to have transponders for motorists to be charges accordingly. However, there should be an attractive and efficient public transport option for this program to work. Unfortunately, we don’t have such along most roads. Perhaps an experiment or simulation can be undertaken once the LRT 2 extension is completed and operational? That corridor of Marcos Highway and Aurora Boulevard, I believe is a good candidate for congestion pricing. With the sophisticated software that are now available, it is possible to conduct studies that would employ modelling and simulation to determine the potential impacts of congestion pricing on traffic. It should have a significant impact on congestion reduction even without mass transit systems such as Singapore’s. However, without good public transport, it would be punishing for people who are currently using their own vehicles to avoid taking public transport. I used the term ‘punishing’ because congestion pricing will be a back breaker for people who purchased vehicles to improve their commutes (i.e., they likely were not satisfied with taking public transportation). These are the working people and part of the small middle class whose transport needs should be addressed with urgency. By d0ctrine in Behavior, Economics, Infrastructure, Land use, Mode Share, Policy, Public Transport, Traffic Congestion, Traffic Management, Transport Planning on September 1, 2015 .